WELCOME- to your home-away-from-home on Maury Mountain Lane. This custom, 2000-square-foot home nestled in the trees has wonderful mountain decor furnishings with all the amenities. Everything you need and then some. Our home is located near Sunriver's Woodland Golf Course. Just a short walk on the bike path will take you to the clubhouse, north swimming pool, tennis courts, or the Sunriver Market Place. The home features a reverse living floor plan, which is a very comfortable open style with lots of natural light and vaulted ceiling. On the main floor (upstairs) you have the living room, dining area, kitchen, one-half bath, and master bedroom. The living room has a stone fireplace (wood provided), cozy setting with a vaulted cedar ceiling, which overlooks the back into the large wooded area. The dining area has seating for eight with three more at the counter. There is access to the top deck from the dining area where you will find a gas barbecue, umbrella table, love seat glider, and seating for more. The kitchen is fully equipped with everything you would ever need. The master bedroom has a king-size bed and access to the deck which will take you to the hot tub on the lower deck. The lower level is where you find the cozy family room with a queen-size sofa sleeper. You have access to the lower deck where the hot tub is and a chairlift swing for those relaxing days. Off the family room is the second master suite which has a queen-size bed. Bedroom three is also off the family room which has two sets of bunk beds, with one set having a double-size bed on the bottom. Bathroom three is off bedroom three and the family room. The laundry room is off the family room on the way to the garage, where there are plenty of bikes for the whole family and friends. We also have a foosball table and a ping pong table. We have all the bikes you will need. There is over 30 miles of bike trails just waiting for you to explore. ** We have 8 Unlimited SHARC Passes included in your stay. This saves you hundreds of dollars with these unlimited use passes! Access to SHARC aquatic pools, Tubing Hill, Tennis Courts, and the Sunriver Owners boat launch. Please be our guests on Maury Mountain Lane and enjoy the comfort of our home as well as the many activities Sunriver and Central Oregon has to offer. If this home is booked please see the VRBO's below for our other Sunriver Properties. Hawaiian Vacation? We also have 3 condos on Maui!! My wife and I both love Sunriver so much, we not only own 5 properties here, we live here part time. We take great pride in each of our homes and condos. These are also our homes and this how we treat them. We are continually updating and improving each property, as our repeat guests will tell you. We purchased our Maury Mtn home when our children were young. We vacationed here several times a year and just fell in love with Sunriver. There is just an endless amount of activities in and around Sunriver. Our home is just 3 home lots away from the 40+ miles of bike trails in Sunriver, which is one of our favorite things to do. After a long bike ride or day on the mountain, the hot tub is a must. We even have pool towels for you. The kitchen is well stocked for any meal you may want to prepare. We were very comfortable with 2 families sharing the house. The bunk room was perfect for the kids and the adults had their space. The kitchen had everything we needed and we were all able to fit around the table. We enjoyed using the aquatic center but weren’t able to fun much space to sled. Overall our trip was very good. Would recommend this home. It was wonderful in every way! The house was beautiful and so clean. And it was huge! Most rentals lack in bathrooms, but each bedroom had it own bathroom with shower and tub, plus another half bath off the kitchen. This is a very nice and comfortable home. Very clean throughout with comfortable bedrooms, a great living area, nice outdoor decks with good seating, and a well-appointed kitchen. Excellent supply of bicycles - we used 5 of them. Well laid out home has plenty of space to get together but also a separate downstairs for another couple or family, making it suitable for a longer stay too. Very responsive owner with timely information. We would definitely go here again. Enjoyed the toys in garage and hot tub! Our three generations all had a great stay. Always a great time in Sunriver! 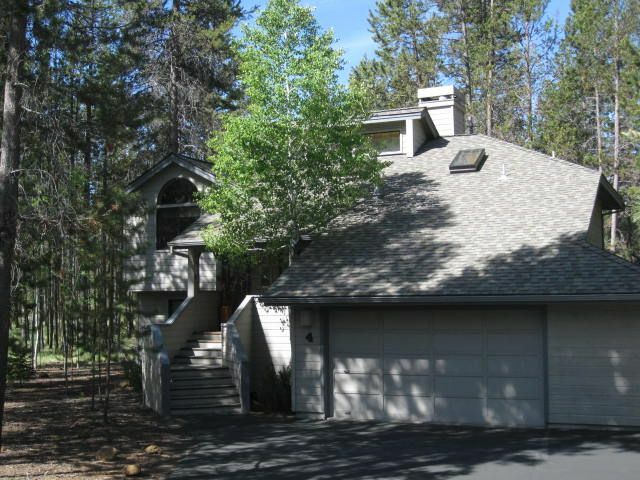 This Sunriver home is always in great condition and has a nice layout for two families. Thanks for another great stay! It had the right space for 4 adults and 4 kids. There were games, bikes for everyone, it was in a quite part of Sunriver so our kids could rollerblade. The Sharc was great. They really had everything we needed it was close to the store and it was clean. My two year old was awed by all the animals on the walls. --One Day rentals booked on a individual basis. --25% deposit to hold reservation, balance due 45 days prior to stay.